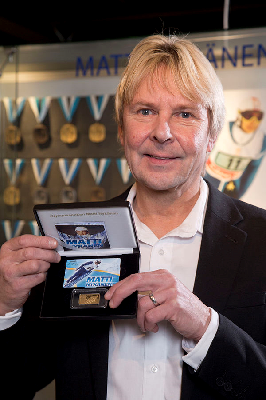 World class talent comes at a price as the tragic tale of Matti Nykanen, the greatest ski-jumper of all time, lays bare in his obituaries. Born on 17 July 1963 1 am in Finland, he was hyper-active and disruptive as a child until his father in despair sent him for lessons when he was 8. By 12 he was ski-jumping for nine hours a day. Through two Olympics in 1984/88 and world championships he collected gold medals and broke records. But he had started drinking at 14 which started to take its toll in increasingly erratic behaviour. After retiring he launched a career in pop music, ended up working as a stripper, tore through six tempestuous marriages and twice went to prison for serious assaults. 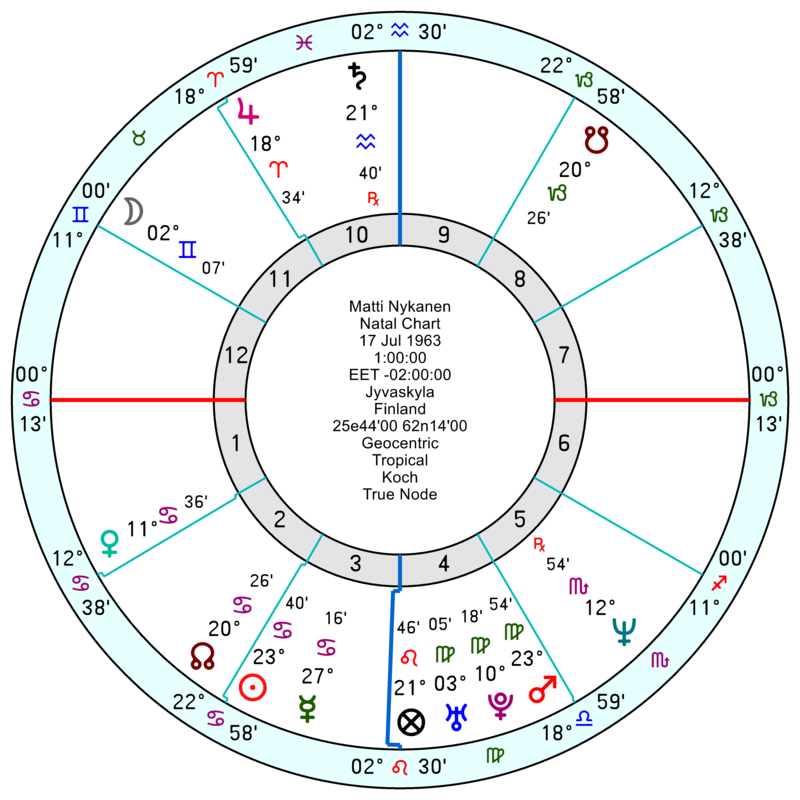 He had a sharp-witted 3rd house Cancer Sun and Mercury in an expansive and confident square to Jupiter in upfront, pro-active Aries. 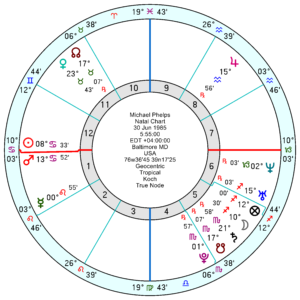 Neptune was in his sporting and romantic 5th and trine Venus, sextile Pluto (Uranus); with his restless Gemini Moon also square Uranus Pluto which would certainly make him emotionally highly-strung and restless. 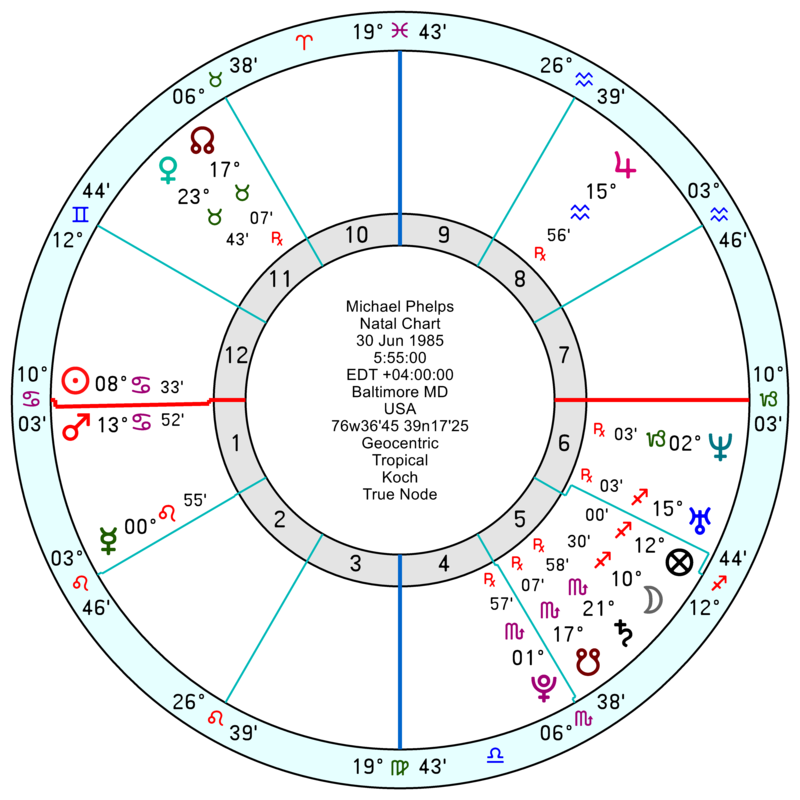 What marks his chart out as different is a tricky Yod of Sun sextile Mars inconjunct Saturn in his 10th in Aquarius. Saturn in Aquarius can be domineering and emotionally cold. The Yod itself would make him feel out of step with his environment until he found his own track. Michael Phelps, the Olympic swimmer, who was also hyper-active until he was sent off for swimming lessons at an early age, has a Yod as well. Though in his case an easier one onto Mars from an adventurous Jupiter sextile Uranus. Nykanen’s Saturn apex planet is a hard task master that requires real maturity to get the better end of it. 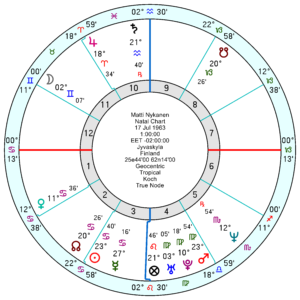 His obsessive 11th harmonic was strong; as was his superstar 22H though it was heavily stressed. And was his ‘breakthrough’ 13H. Retiring from any world class sport is painful but when it’s one that involves launching off mountains at 60mph, accelerating to more than 100mph and soaring 250ft above the ground, it’s difficult to see what could ever replace that kind of adrenaline rush for a temperament that was addicted to it.